Amazing! It’s time for a toast. 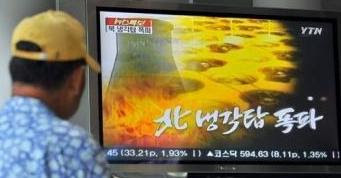 North Korea blew up its cooling tower today at the Yongbyon nuclear plant. North Korea destroyed part of its Yongbyon nuclear plant where it processed weapons-grade plutonium in a symbolic gesture today, after the U.S. said it will begin removing the communist nation from its terrorism blacklist. The move comes a day after Kim Jong Il’s regime submitted an inventory of nuclear plants and materials, as required under its disarmament accord with the U.S., South Korea, China, Russia and Japan. The explosion completely demolished Yongbyon’s 20-meter (66- foot) concrete cooling tower at around 5 p.m. Korea time, footage on South Korea’s MBC Television showed. MBC and CNN were among five media organizations from countries involved in disarmament talks invited to witness and report on today’s event at Yongbyon. “This is a very important and significant step,” Sung Kim, director of the U.S. State Department’s Korea office, who attended the blast today, said in an interview according to the MBC footage. Secretary of State Condoleezza Rice, currently in Japan on a tour of North Asia, said today she has “no plans” to visit North Korea. Sung Kim will probably meet with North Korean officials during his visit and discuss remaining steps the state must take to disable its nuclear programs, U.S. State Department spokesman Tom Casey said yesterday. He will also discuss “some ideas on verification” of the dossier handed over yesterday. Condoleezza Rice explained today in The Wall Street Journal how diplomacy is working in North Korea. One Free Korea is not so impressed.